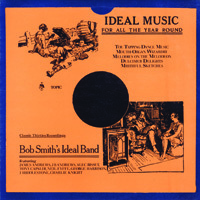 Bob Smith’s Ideal Band was the cente of a group of Glasgow musicians, singers and omedians, who played dance music, sang popular songs and enacted sketches on the Beltona label in the 1930s. Their colourful and entertaining music is the sound not of a folklorist’s collection but of a genuinely popular regional idiom as it was recorded in its day. This 1977 collection was lovingly compiled from their finest 78rpm recordings.